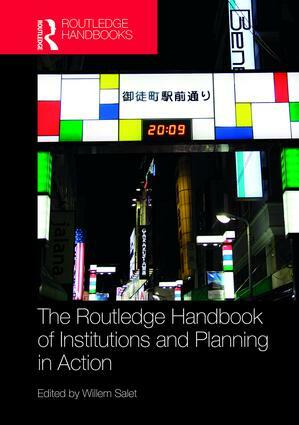 The Routledge Handbook of Institutions and Planning in Action contains a selection of 25 chapters prepared by specialized international scholars of urban planning and urban studies focusing on the question of how institutional innovation occurs in practices of action. The contributors share expertise on institutional innovation and philosophical pragmatism. They discuss the different facets of these two conceptual frameworks and explore the alternative combinations through which they can be approached. The relevance of these conceptual lines of thought will be exemplified in exploring the contemporary practices of sustainable (climate-proof) urban transition. The aim of the handbook is to give a boost to the turn of institutional analysis in the context of action in changing cities. What Can We Learn from Evolutionary Theory When Confronting the Deep Challenges of Our Times? Willem Salet is professor emeritus of urban and regional planning at the Faculty of Social and Behavioral Sciences, University of Amsterdam, the Netherlands. He chaired the group Urban Planning until 2017. He was the scientific director of the Amsterdam Study Center for the Metropolitan Environment (AME) 2008-2013. He was the president of the Association of European Schools of Planning (AESOP) 2008-2010 and was awarded an honorary membership of AESOP in 2016.